It seems to me that Russian paper artists and graphic designers, Alexei Lyapunov and Lena Ehrlich of People Too, are more accurately described as paper magicians. By snipping, folding, and shaping tiny pieces of colored paper, the duo manages to capture personalities and the very nature of daily life. Just look at the body language of the girl and guy above... don't you feel like you've stepped into their world? If I was sitting across the aisle, I'm pretty positive I'd be listening in on the conversation. Fair warning... perusing the wonderfully detailed all-paper scenes Alexei and Lena have posted on the Behance Network might keep you busy for quite a while - good thing there's a weekend coming up! Its sooooo wonderful.Such delightful little things. The tiny computer , newspaper and the little boy looking out of the window -all so adorable. I think there is a loose coil inside the coffee mugs. Fun! And you're right: I'd totally be listening in on that conversation, too! 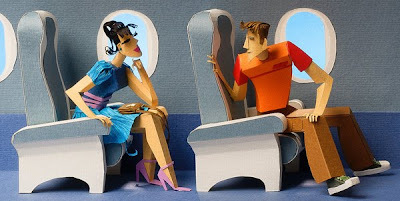 Amazing that so much can be conveyed through the body language of little paper people. Amazing! I can't even imagine the amount of work that goes into those projects. Just stunning. I didn't have time to comment but I did check this post and their site the other day and was blown away. The movement and details is amazing. It was hard to tell how big the scenes were until you saw the hand and then the cat...which gave great perspective.